Before and after laser tattoo removal: After receiving laser treatments from her dermatologist (right), the permanent lip liner is gone. Lasers have largely replaced other tattoo-removal methods. While the technology has improved, your results still depend almost entirely on the person performing the tattoo removal. This is why the FDA recommends that you consult a dermatologist. To give you a better understanding of what to expect from laser tattoo removal, you’ll find answers that patients often ask dermatologists about tattoo removal. I just want a tattoo removed. Why do I need a consultation? A consultation can be helpful for you, too. It gives you an opportunity to ask questions. You may want to ask to see before-and-after photos of patients your dermatologist has treated with laser tattoo removal. Seeing these photos can show you what to expect. Can’t I just go to a tattoo shop or spa that offers laser tattoo removal? For laser tattoo removal to be safe and effective, the person removing the tattoo must consider many things, including your health. Dermatologists have the medical training needed to consider your health and the health of your skin. They know who can safely have laser tattoo removal. If you decide to go to a tattoo artist or aesthetician, you won’t have the benefit of this medical training. Side effects are more common when someone lacks medical training. What are the possible side effects of laser tattoo removal? Some people develop light or dark spots on their skin. These spots tend to disappear within 6 to 12 months. Because tattoo artists and aestheticians often use only one laser, it’s also possible that you’ll still see some of your ink. A single laser cannot remove all ink colors. I want to get my tattoo removed now. Why will I need more than 1 laser treatment session? When you get a tattoo, the tattoo artist layers the ink. A laser cannot safely break down all the layers in 1 treatment session. Time between treatments is also necessary for your health. Your skin needs time to heal. After laser tattoo removal, you may see some redness, swelling, and a little blistering. Your body also needs time to flush out the ink. Yes, your body rather than the laser eliminates the ink. When the laser’s light hits the ink, the light shatters the ink into tiny particles. Your body must flush out these tiny particles. After each treatment, your tattoo should lighten. Is laser tattoo removal safe for everyone? Most people can safely have laser tattoo removal. There are a few exceptions. You need a healthy immune system for laser tattoo removal to work. And, women who are pregnant or breastfeeding should not be treated. Laser tattoo removal can feel uncomfortable or painful. To prevent discomfort and pain, a dermatologist can give you a numbing cream or shot. Is there anything that I can do to improve my results? Keep all of your appointments for laser tattoo removal. Too often, people stop treatment before they see optimal results. Each treatment removes more ink. Follow your dermatologist’s instructions for at-home care. You may need to wash the area and apply an antibiotic ointment for a few days. Slathering on moisturizer and covering the area until the skin heals are also important. Protect your treated skin from the sun for 3 months. The best way to protect your skin is to wear clothing that covers the area. The clothing covering your treated skin must block light completely. 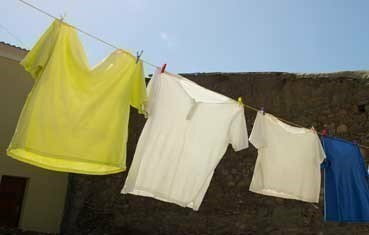 You want to cover your treated skin with clothing that completely blocks light: The white and yellow shirts in this picture let light shine through. I have a small tattoo. Won’t a tattoo-removal cream or ointment work just as well as laser tattoo removal? Resist the temptation to take on tattoo removal as a do-it-yourself project. Your health and the appearance of your skin are at stake. Effectiveness: There’s no evidence that any of these products can remove a tattoo. Safety: The products often contain strong acids that can damage your skin, causing a rash, burn, or permanent scar. And, you’ll still have that unwanted tattoo. Is it safe to use salt to remove a tattoo at home? You’ll find plenty of videos that show you how to use salabrasion (the technique that uses salt to remove a tattoo) at home. Salabrasion involves removing the top layers of your skin and then rubbing salt into the raw skin to scrub away the tattoo ink. This is extremely painful. You may get a serious infection. When your skin heals, you may have a scar. Dermatologists understand that people want a tattoo removed quickly. To give their patients faster tattoo removal, they continue to research technologies and techniques. The results from this research look promising. In one study, patients safely had 4 laser treatments in 1 day. Dermatologists also are finding that they can remove more ink by using different lasers. In one case, patients had as much as 50% of the ink removed during 1 office visit. More research is needed before these treatments become widely available, but one thing is certain. Lasers continue to outshine other tattoo-removal methods. 1Image (tattoo removal) used with permission of Journal of the American Academy of Dermatology: J Am Acad Dermatol. 2003; 48:271-2. American Academy of Dermatology, “New and improved laser and light treatments take aim at cellulite, fat, tattoos, wrinkles, and sagging skin.” News release issued Mar. 21, 2014. American Academy of Dermatology, “Lasers lighting the way for enhanced treatment of melasma and tattoo removal.” News release issued Feb. 7, 2012. Green JB, Metelitsa, AI. “Optimizing outcomes of laser tattoo removal.” Skin Therapy Lett. 2011 Nov-Dec;16(10):1-3. Kirby W, Chen CL, et. al. “Causes and recommendations for unanticipated ink retention following tattoo removal treatment.” J Clin Aesthet Dermatol. 2013 Jul; 6(7): 27–31. Kossida T, Rigopoulos D, et. al. “Optimal tattoo removal in a single laser session based on the method of repeated exposures.” J Am Acad Dermatol. 2012 Feb;66(2):271-7. Mafong EA, Kauvar ANB, et. al. “Surgical pearl: Removal of cosmetic lip-liner tattoo with the pulsed carbon dioxide laser.” J Am Acad Dermatol. 2003 Feb; 48(2): 271-2. U.S. Food and Drug Administration, “Inked and regretful: Removing tattoos.” January 30, 2013.